Paddy Reid was a centre on the famous 1948 team. 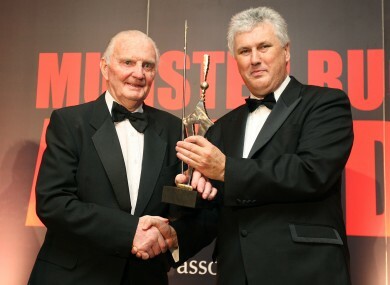 Paddy Reid (left) being presented with a Munster Rugby Hall of Fame award by Gerry O'Loughlin in 2008. IRELAND, MUNSTER AND Garryowen rugby legend Paddy Reid has passed away at the age of 91. The proud Limerick man was a centre on the Ireland team that won the Grand Slam in 1948. Reid made his debut against Australia in 1947 before Five Nations wins against France England and Wales – he missed the game against Scotland. He was a successful sportsman across a number of codes, also playing hockey, rugby league and soccer to a high level. After winning the Grand Slam in 1948, Reid went to England to play rugby league for Halifax which included a Challenge Cup final appearance against Bradford in front of 99,000 people at Wembley Stadium. Reid accumulated just four caps for Ireland but most of them came in one of the most successful years in Ireland’s international rugby history – 1948. Until the class of 2009 emulated the feat in the Six Nations, it had been Ireland’s only Grand Slam year. The IRFU was quick to issue its condolences today on Twitter. Email “Irish rugby mourns death of Grand Slam hero”. Feedback on “Irish rugby mourns death of Grand Slam hero”.